The Armed Services Vocational Aptitude Battery (ASVAB) is a timed multi-aptitude test designed to determine if you are qualified to enlist in the U.S. Armed Forces and assign the appropriate job in the military. The test covers standard academic areas, such as math and English, but also measures your knowledge of mechanics, electronics, science, and assembling objects. 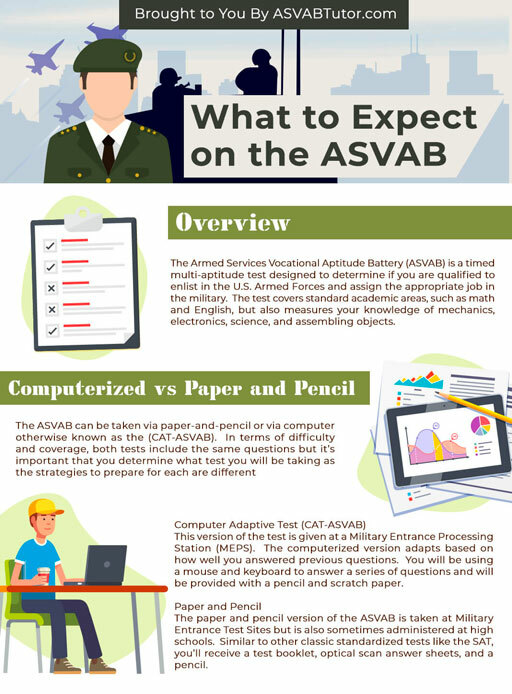 The ASVAB can be taken via paper-and-pencil or via computer otherwise known as the (CAT-ASVAB). In terms of difficulty and coverage, both tests include the same questions but it’s important that you determine what test you will be taking as the strategies to prepare for each are different. This version of the test is given at a Military Entrance Processing Station (MEPS). The computerized version adapts based on how well you answered previous questions. You will be using a mouse and keyboard to answer a series of questions and will be provided with a pencil and scratch paper. The paper and pencil version of the ASVAB is taken at Military Entrance Test Sites but is also sometimes administered at high schools. Similar to other classic standardized tests like the SAT, you’ll receive a test booklet, optical scan answer sheets, and a pencil. AFQT scores are reported as percentiles between 1-99. For example, an AFQT score of 72 indicates you scored as well as or better than 72% of the nationally-representative sample of 18-23 year old youth.